Bingo Addition and Subtraction is a hands-on activity for math stations that provides a concrete visualization for students in the area of number sense, computation, and algebraic thinking. All you need is graph paper with one inch squares, two dice, and bingo dabbers of multiple colors. Student rolls both dice. For example’s sake, let’s say he rolls a 3 and a 3. Then the student puts 3 bingo marks on the graph paper with one color and 3 with another color to model the math equation. This is a great visual representation of the math thinking, which is a Common Core State Standard Processing skill. Next, he would write the equation under the picture. Let the creativity fly! I used this activity as a math station when I taught first grade. The team of experienced teachers I joined shared this idea with me. I introduced this station to my students during a large group mini-lesson session. The modeling lasted for 2 minutes and I showed the students where the materials would be kept. (They already knew the procedures for getting the materials and putting them back.) Our class had a short discussion of what types of equations they thought they could roll with the two dice. This simple step helped them to visualize and verbalize their math thoughts, a technique that is used many times as a reading strategy. This short discussion sparked everyone’s math thinking. One advanced student asked if we had to use only two dice. Curious because of his question, I asked him to share more information about his thoughts.. His reply was that he knew we could add two addends together because we had been doing that, but his older sister added more addends together. He wanted to know if we could do that too. I was excited that any first grader made that connection. Acutely aware of all the eyes watching my face, I told him we possibly might be able to do that, but we would need to see an example to completely understand this idea. (My intent was to see if he could become the facilitator for the group now instead of me.) He thought for a moment and then he came up front. He took four different colored bingo dabbers. He made two marks with each color. Underneath he wrote the equation 2+2+2+2=8. (At this point, I was so excited I almost fell out of my chair, but I kept my poker face on:) I told him he had definitely modeled and written an equation. I asked him to explain how he could get that equation. He responded, “If you take four dice, roll them, all four land on 2, then you have this equation.” He was right! I looked at the eyes that were glued on him. They came alive with math thoughts and new questions. Ryan fielded the questions. Some of my students started out adding 3 or 4 addends together. Others just wanted to do two addends until they became comfortable with it. Eventually two addends was too easy for them. They had discovered and established a schema for addition that led them quickly from concrete thinking to more abstract algebra. All from a group of first graders that were taught to discover and discuss math. 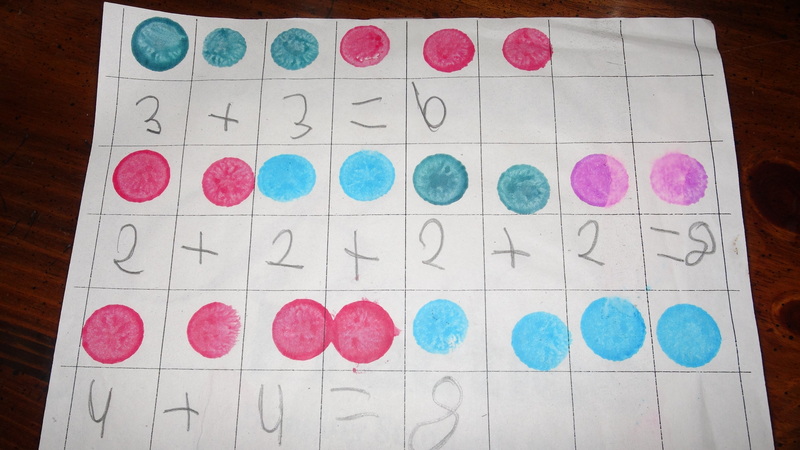 Yes, eventually we used this activity to show subtraction by making all the marks and then crossing them out to show subtraction. One real go-getter showed two-digit addition. This station works well because it uses concrete examples and can be used repeated times for different Math Common Core State Standards. Which math station would this be in a Guided Math model? This would work in the practice page station or skills station. Bingo addition would work with second semester Kindergarteners, all first graders, and beginning second graders. Note: some parents will donate bingo dabbers to your classroom if you ask at Open House night!